One formation's 'tweener is another's prototype. Victor Clore isn't quite the poster boy for rush end in the 4-3, but he gets closer with each pound of muscle he gains. 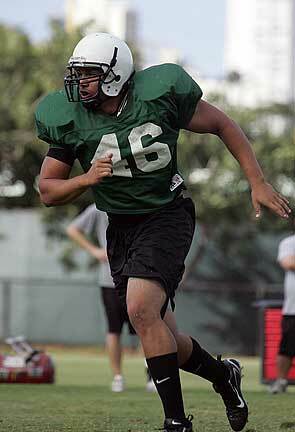 The 6-foot-2 sophomore from Castle is up to about 250 now, and it was clear in 1-on-1s yesterday that he is among the quickest and most agile linemen at Hawaii spring football practice. Clore blew by the offensive linemen and had their coach, Dennis McKnight, barking extra long and hard. "I've just been training hard with all the guys out here. Working out, trying to put on weight," Clore said after yesterday's workout. "I just want to help out any way I can, get on the field." But before defensive coordinator Greg McMackin returned to UH last month, Clore was a man without a position -- or, at least one that he could play on a regular basis. "The 4-3 helps him because from a physique standpoint he's more suited for this," defensive line coach Jeff Reinebold said. "He was gonna be a real undersized end in the 3-4. In the 4-3 you're more up the field and you're looking almost for outside linebacker type bodies. 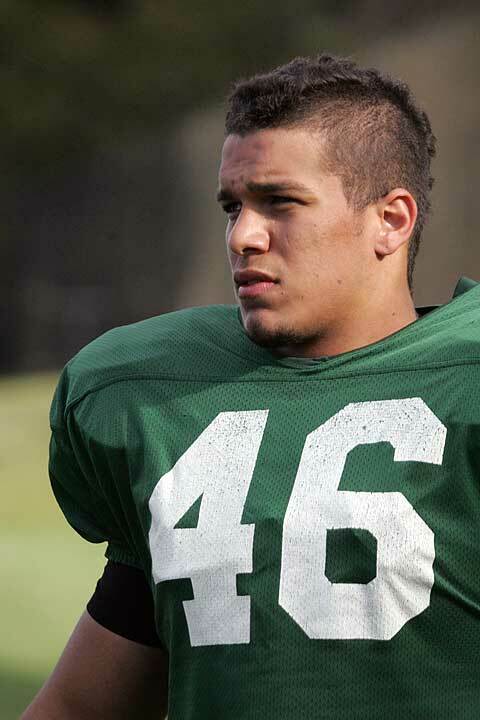 It really does give a chance for guys like him who are athletes to be on the field." Clore knew what he was up against previously. "In the 3-4 it's more difficult because you have to take on more guys and you have to be around 280 (pounds)," he said. Clore only got into the two-deep last year because of a spate of injuries to bigger defensive linemen near the end of the season. If Jerry Glanville had remained, Clore's destiny seemed to be that of a sparingly used pass-rush specialist. "Now he has the chance to be an every-down guy at the end position," Reinebold said. There is plenty of competition, even with Ikaika Alama-Francis and Mel Purcell working out for the NFL Draft now instead of the Warriors. Amani Purcell and Karl Noa are the tentative starters, and John Fonoti is expected to be back in the picture in the fall. But Reinebold believes Clore -- who also played wide receiver in high school -- to get better with every practice. "Greg asked us to evaluate the players at the end of each week of spring practice and on Victor's report I wrote we need to give him reps. He needs playing time, the opportunity to learn by doing," Reinebold said. "It's not Ikaika coming off the basketball court, but it's about as close as you can get. When you're out there with high socks and gloves and a towel, and all of a sudden you gotta line up and be a man, it's a different deal." Head coach June Jones said he wouldn't be surprised if Clore ends up getting meaningful playing time this fall. "Last year watching him on scout team, we knew he had a chance to be a player," Jones said. "He's shown that so far in spring ball. He has a good motor and does what he's supposed to do." Mississippi State is still looking for another opponent for 2007, but dates would have to be juggled if it is to be UH. Hawaii athletic director Herman Frazier said he's still working on adding a game for a 13-opponent schedule, but didn't provide details on who the other team might be. "I am having conversations with prospective football opponents, but there is no information to report at this time," he said. Outside linebacker Adam Leonard made the play of the day. He leaped to tip a high pass, and then dove to catch the ball. "I was just tracking the ball and my eyes got wide. I told myself I can't mess up on this opportunity." ... Cornerback Gerard Lewis got in the act, picking off Colt Brennan's first pass of team drills. Later, Lewis was all alone, but couldn't handle a stray wobbly throw by Inoke Funaki. "Colt throws it straight and on a line," Lewis said. "He's just out here to get us better and we're here to get him better." ... Lewis said McMackin's philosophy allows the corners more interception opportunities. "It's different because there's more zone. We can read the quarterback more instead of playing man all the time. We get a chance to make plays on the ball." ... Running back Mario Cox looked good before rolling an ankle near the end of practice.